When you head away from the hustle and bustle of Liverpool Street station, in the direction of London’s famous Spitalfields market, it’s hard to imagine you’re about to step a century or two back in time but that’s exactly what lies behind the heavy black door of number 18 Folgate Street. 18 Folgate Street was the home of American artist and anglophile Dennis Severs who dedicated two decades of his life to marrying his passions for history and mischief by restoring the house to it’s 18th and 19th Century glory days. Settling in London in the late 1960s Severs spent a number of years running carriage tours before purchasing the Georgian property and making it his life’s work until his death at the young age of 51 in 1999. Before he passed away the artist sold the property to the Spitalfields Trust who have lovingly upheld Severs’ creation in a manner the artist would no doubt have loved. We arrived at the house shortly before our allotted time and knocked on the door. Seconds later we were greeted by one of our hosts who kept us in the cold a little longer while he explained the evening’s proceedings. As the artist intended, tours are self-led and conducted in silence. Photography is not allowed so the above picture is all I was able to capture on the evening I’m afraid! I have to confess I loved this because you could totally switch off and concentrate on your surroundings and I really did feel transported to another time and place. Once inside we began our tour in the basement. 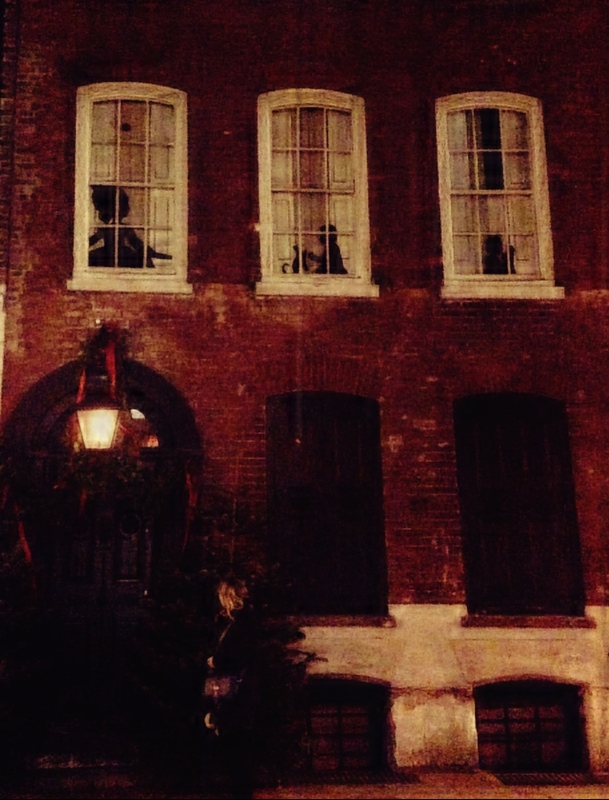 As we opted for a Christmas candlelight tour we got just that. There is no electricity in the house, (at least there was none that candlelight guests were privy to although I’m told Mr Severs did have two electric lightbulbs installed when he moved in), so the flicker of the various flames dotted around the house made the tour quite atmospheric. Each floor in the house pays homage to a fictitious family of Huguenot silk weavers – the Jervis family – who lived in the house from as early as 1724 right up to the beginning of the 20th century. The idea is that as you arrive you enter the house as an unexpected guest forcing its inhabitants to vacate while you are there. As their time in the house has been interrupted nothing is tidied away. The food and wine you see are real, as are the fires and, although I didn’t notice it during our tour, I’m told that the chamber pots in the bedrooms are filled with urine as well for authenticity’s sake. If anything Mr Severs appeared to be a stickler for detail! As we made our way through the property we could hear noises alluding to the inhabitants who had hastily exited as we arrived. Horse hooves clip-clopping on the cobblestones outside; grandfather clocks chiming; the remnants of a party and the tale of Ebeneezer Scrooge relayed in the attic. The house is crammed full of things – even more so at this time of year with the Christmas installation in place. Nonetheless, Severs’ hope was that visitors would look beyond each individual item and absorb the sights, smells and sounds of each room to get an overall picture of the scene that took place before they arrived.